Dr. Smith's ECG Blog: Is it Wellens' Syndrome? A middle-aged African American man with history of tobacco use, HTN, and chronic renal disease, but no known coronary disease, presented with chest pain. Symptoms in the 24 hours prior to presentation: On the evening prior to admission, he had an episode of sharp stabbing chest pain while talking to his wife, which improved after 30 minutes. This recurred on the morning of the date of presentation. He did not seek care for these episodes of pain. On the evening of presentation, the chest pain recurred at work, with increased pain radiating to his shoulder and neck in the afternoon, associated with diaphoresis and SOB. He was given ASA and nitro by medics with improvement. He was pain free on arrival. 1. Computerized QTc is 391. There is a bit of ST elevation in V2 and V3, and the T-wave turns sharply downward, with a trace of terminal T-wave inversion in V3. 2. Now the QTc is 411 and there is definite terminal T-wave inversion in V3, and some also in V4 and V5. Importantly, there is none in V2. At this point, I was worried that this was "Wellen's syndrome" and initiated medical treatment for ACS. 4. Pattern A or Pattern B (see bottom of post) T-wave inversions in V2-V3, and also possibly, in decreasing order of prevalence, V3, V4, and V5. At this point, without any more evolution, I considered that this might not be Wellens' syndrome, which in a persistently pain free patient usually continues to evolve, and not resolve. I thought I might have been deceived by a Wellen's mimic. So I decided to look back at ECG 2 and realized that I had, indeed, been deceived. Left Ventricular Hypertrophy is the other common mimic of Wellens' syndrome. Here is a representative case. Here is another case of benign T-wave inversion, with a detailed discussion. In both ECGs, V3 and V4 have the classic look of BTWI, which particularly involves very tall T-waves, and almost no S-wave, in the leads with biphasic T-waves. Beware, however, because unstable angina can also have dynamic t-wave inversion that mimics Wellens' waves, which appear and disappear. See this case. For the classic evolution of Wellens' waves over 26 hours, see this case. 5. Recorded 4 hours after arrival, and 2 hours after ECG #4. 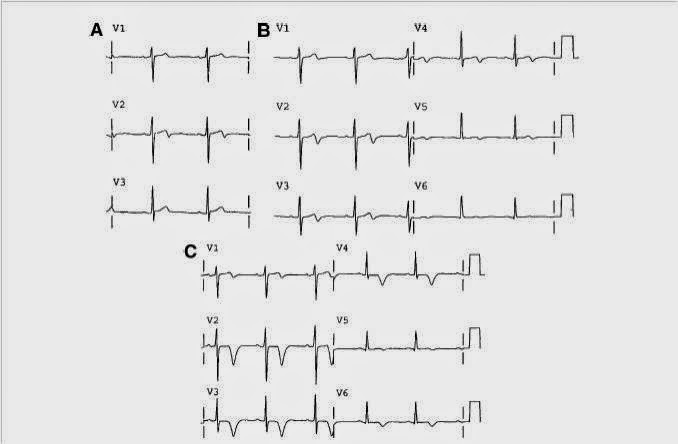 He ruled out (all contemporary troponins less than 0.03 ng/mL). In spite of this, because of his ECG, he underwent an angiogram. It was completely normal. 6. Now there is no trace of terminal T-wave inversion!! Here is another post on Benign T-wave inversion: Wellens' syndrome - NOT! 2. Wellens' is a syndrome, not an ECG finding. 3. If it is truly Wellens,' it will evolve and there will almost always be postive troponins. 4. Even if the whole syndrome is present, as in this case, there are false positives. Benign T-wave Inversion (BTWI) is one. 5. BTWI can be dynamic. BTWI is a normal variant associated with early repolarization. K. Wang recently studied it. He reviewed ECGs from all 11,424 patients who had at least one recorded during 2007 at Hennepin County Medical Center (where I work) and set aside the 101 cases of benign T-wave inversion. 97 were black. 3.7% of black men and 1% of black women had this finding. 1 of 5099 white patients had it. Aside from an 8.8% incidence (9 of 109) black males aged 17-19, it was evenly distributed by age group. 4. The T-wave inversion does not evolve and is generally stable over time (in contrast to Wellens', which always evolves). Labels: Benign T-wave Inversion, Wellens' Syndrome - NOT!! Thank you for a very thought-provoking case. Could you possibly discuss your observation #4 regarding the general stability of benign T wave inversion over time? In this particular case, the BTWI was dynamic and evolving over a period of approximately 4 hours or so and resolved at one week. There is very little literature that actually discusses BTWI other than to describe its presence and epidemiology. Have you found it to be present in patients without episodes of chest pain - as in early repolarization, or does it only appear during chest pain that does not represent occlusive disease? Dr. Jones, thanks for the note. It is a baseline abnormality that is not related to the chest pain. It is very closely related to early repol; in fact, most have some degree of ST elevation and J-waves just like in early repol. Some do indeed change over time. K. Wang, in his study of 101 cases, found that a significant number (I don't know the exact number) would change from ECG to ECG. Most do not. That is why I say "generally", but not universally. I hope that answers your question.